Where do you store your sleigh in the summer? I'm glad I don't need an entirely different car for winter travel. My great-grandfather had one stored under his apple house when I was a child. Sadly it burned up when there was a fire that destroyed that building in the late 1960's or very early 1970's. 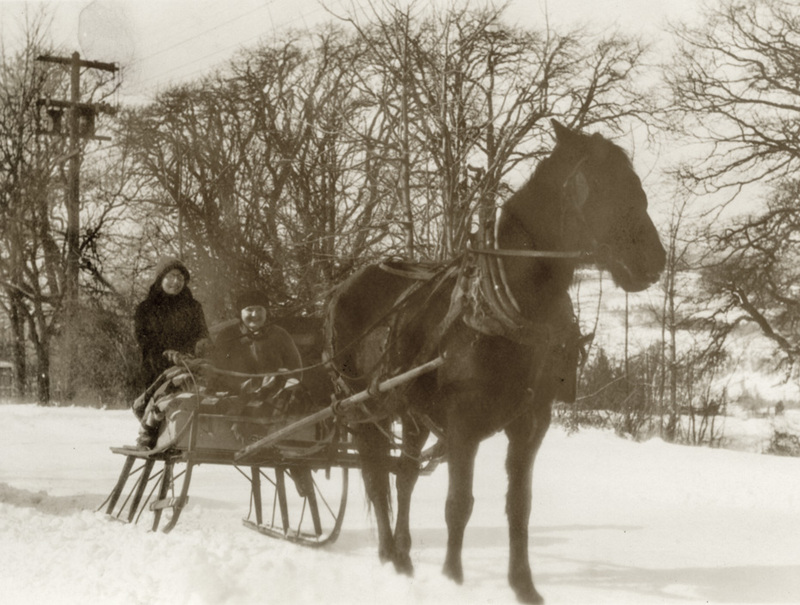 No doubt the horse pulled the buggy in the summer and the sleigh in the winter. How much fun would it be to have one now and when we have big snows take children for a real ride............?????? Can you imagine getting all of that paraphernalia hooked up to the horse, with numb fingers in zero degree weather? As I understand, hauling freight was easier in the winter, because you didn't have to skirt around the swampy areas. You could take a short cut across them. Some old maps will show a summer route and a winter route. Is that horse's hip bone sticking out or is it something else? WAAAM has a little more deluxe sleigh, that was used for many years by the Cooper Spur Ski Patrol. We use it every December for photo ops. Otherwise, you can see it under some ski equipped airplanes in Museum 1, near the west corridor passage way.